Is it La Valette or De Valette? 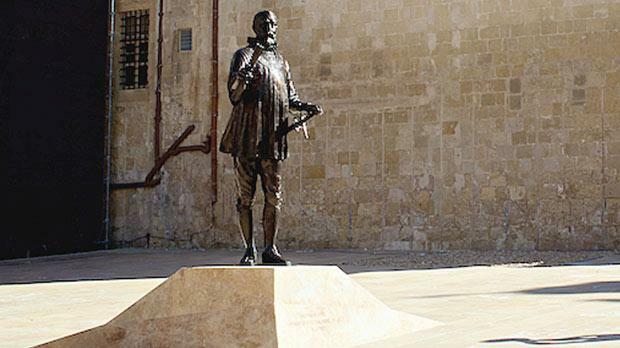 The new monument to the Grand Master in Pjazza Jean de Valette in Valletta. You are taken on a conducted tour of the monuments of the French Grand Masters in St John’s Co-Cathedral. This gives you the opportunity to admire the splendid memorials to Grand Masters Emanuel de la Rohan, Hugh de la Verdalle, Jean de la Valette, Antoine de la Paul and Alof de la Wignacourt. Stop! There is something mighty wrong in that, isn’t there? I would rightly be called ignorant by historians if I said De la Rohan. But then the ignorant applaud me as a historian if I say De la Valette. Let me make it perfectly clear from the outset. The Grand Master of the Order of St John who vanquished the Ottomans in 1565, and built the city of Valletta just after, was Jean de Valette. He always referred to himself as Jean de Valette, and, during his lifetime, everyone – repeat, everyone – referred to him as De Valette, no ifs and buts. When he was alive no one dreamt of calling him De la Valette. No one. Never. Whatever the language used, it was always de and never la or de la. In Latin it was Joannnes or Ioannes de Valetta; in French it was Jean or Jehan de Valette; in Italian it was Giovanni di Valetta. Now I believe that the very first step towards showing respect to a person is to show respect for his name. Peoples’ names are their unique badge of identity. They are a cornerstone of their individuality. Names are what people primarily identify with – the matchless fingerprint of their personality. Mess around with people’s names, and you are assaulting their identity. In my former job I had to deal with desperate cases against states that meddled with people’s names or surnames. Anguished victims would trail all the way to Strasbourg because they resented that ultimate affront to their personality. The European Court of Human Rights had to affirm that “names retain a crucial role in a person’s identification”. And that your right to your real name and surname is a fundamental human right. The Strasbourg Court found that tampering by the state with the name a person chooses to be identified with is a violation of that fundamental right. States have been condemned to pay damages for these odious intrusions with a person’s right to his or her name. And here we are, merrily imposing on a heroic Grand Master a name he never wanted, in a style he never used, and in a manner no one dreamt of using in his lifetime. Should we care how he wanted to be known? Of course not – we know better than him. We believe we have the right to impose fiction over truth, to submit him to what new christenings tickle our own fantasy. We insist that it is what we want that counts, and that what he wanted is irrelevant. We will change his name to suit our ignorance, rather than preserve it to suit his dignity. We prefer to nourish our presumptuousness rather than respect his identity. I repeat an invitation I had made on a previous occasion. I can cite literally thousands of instances in which the Grand Master called himself de Valette. I can equally cite literally other thousands of instances in which his contemporaries called the Grand Master de Valette, independently of the language used. I will retract and apologise if, against these thousands of documented instances which I can produce, someone digs up one single use of La Valette or De la Valette during the Grand Master’s lifetime. So far, not one of the naysayers, some strikingly strident, has risen to such an easy challenge. Let me make a couple of clarifications. Sometimes an abbreviated form is found: Valette only instead of de Valette – but never La or De la Valette. Again, following the fashion of the age, when the spelling of names in Europe had not crystallised and these were written down as one thought one heard them, it was completely normal to find the Grand Master’s name written with one ‘l’ or with a double ‘l’, with one ‘t’ or with a double ‘t’, and with or without the final ‘e’ or ‘a’. Shakespeare had his name written in scores of different ways, and de Valette suffered a similar fate. In this essay I will always use the spelling most current today: Valette, even if the original text may have used other variants listed in this paragraph. Let’s start with the Grand Master’s autograph signatures – his most assertive manifestations of ego (forging or altering a person’s signature is considered an intolerable violation of that person’s intimate identity). Well, all the Grand Master’s surviving autograph signatures have Jehan de Valette. Not once did he sign De la Valette or La Valette. So also are all the surviving letters addressed to him. All show Giovanni, Joannes or Jean de Valette. No one dreamt of addressing him as De la Valette. 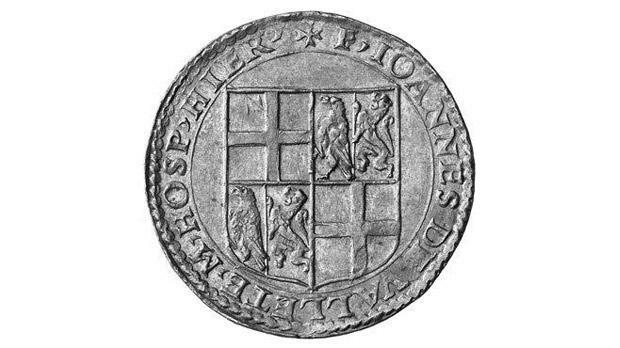 The Grand Master repeatedly minted coins during his term as head of the Order. Restelli-Sammut listed 138 separate de Valette issues: gold, silver and bronze, high and low denominations, all with different patterns and with the reigning Grand Master’s name on them. Not a single one of these 138 has La Valette or De la Vallette – not one. All, without a single exception, show de Valette and a few simply Valette. Valette on its own is also found on other documents. On special occasions, to celebrate important events, like the founding of his new city, the Grand Master ordered the minting of commemorative medals. Nineteen different ones issued during de Valette’s lifetime have been listed so far, most with his portrait. Not one of the inscriptions around these medals shows La Valette or De la Valette. All, not one excepted, have de Valette or de Valetta. 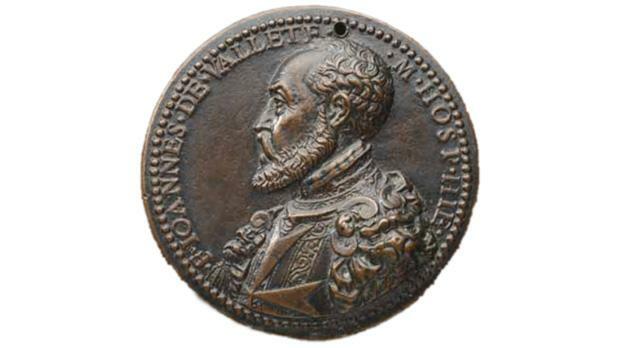 I would go one step further: if someone showed me a coin or a medal with the inscription De la Valette, I would find it ever so easy to dismiss it as a crude forgery. And, on the solemn day of the founding of his new city, the Grand Master wanted his formal edict to build it graven in marble. That inscription lies buried with the Valletta foundation stone, and a second copy in marble was later walled up onto the city gate. Those inscriptions specify that the city was built at the command of Grand Master Joannes de Valetta – and that he ordered that the new city should be called Valletta – double l.
Then there are, literally, thousands of decrees, bulls, certificates, attestations, and so forth, issued by the Grand Master under his name and seal, registered in the Libri Bullarum, and thousands of deliberations by him and his council, recorded in the Libri Conciliarum. Not one of these thousands of official documents refers to the Grand Master as De la Valette or as La Valette. Without one single exception the head of the Order always refers to himself as Jean de Valette, whether they are commands or deliberations. Let me clarify another misconception: one that wants Parisot to be part of the Grand Master’s family name. Parisot was just his personal nickname. Most French knights during the 16th century were better known by their nickname, often a reference to their place of origin, rather than by their Christian or family name. Romegas for Fra Mathurin Lescaut would be another prime example, and so many others. The Grand Master was formally de Valette, and Parisot informally – an affectionate, not an offensive nick. Of course, he never used it in his signature or on his official documents. No harm adding Parisot as long as we are aware it represents a nickname, not a part of his official name. With time, as nicknames sometime do, it got more or less assimilated into his name. When Matteo Perez D’Aleccio engraved his Great Siege fresco cycle, he added copious explanatory inscriptions to the plates in Italian. He records the Grand Master’s name as FRA GIOVANNI PARISOTTO DI VALLETTA (in capitals). Together with portraits on his medals, there also exist a number of contemporary images of the Grand Master, painted or engraved. Those with his name on them invariably have it as de Valette or de Valeta, and so on, never as La, or De la Valette. And, please, don’t throw at me portraits of him made many long years after his death, or modern (mis)translations of his inscriptions. In fact, though I am concerned only with what the Grand Master’s real name was during his lifetime, it appears from a very cursory examination of the records that even his ancestors, or at least some of them, were de Valette. I did not, in documents authentically contemporary to the people, find La Valette or De la Valette among them. The family trees I have been shown, with La Valette on them, were drawn up many years after the Grand Master died, so they prove nothing either way. A lot was written, printed and published about the Grand Master after the Great Siege, generally during his lifetime or shortly after: Brantome, Cirni, Bosio, Balbi di Correggio, Mathieu de Gossancourt and many others have thousands of references to him, in French, Italian, Latin, Spanish, German and Dutch. Guess what? Not a single one calls him La Valette or De la Valette. All contemporary or near-contemporary authors take it for granted that his name was Jean de Valette or its equivalent in the language they were writing. Even the first important ‘official’ history of the Order in French, the one by Jean Baudouin, has him as Jean de Valette or Parisot. As late as 1782 the official statutes of the Order list French Grand Masters under Italianised names, like Antonio Fluviano de la Riviere, Claudio della Sengle, Giovanni de la Cassiere, but not Giovanni de la Valette – just Giovanni Valletta. Undeniably, at some time after the Grand Master’s death, his name started to be misspelt, and the original, correct form, which he identified with, was corrupted to La Valette, and eminent historians, like Vertot and Engel adopted the corrupted version. Even his descendants, after the Grand Master’s death, started to add the ‘La’ or ‘De la’. Why this change happened can only be the subject of speculation. My suggestion is that, with the passage of time, memories of the Grand Master started fading, while the name of the city he built remained a constant presence, a contemporary reality. And that city, outside Italy, was rightly called La Vallette. People began referring to the long-dead Grand Master by the name of the city he built – the two became as one. But, I repeat, this relies more on speculation than on historical fact. Whatever the reason, there is absolutely no doubt that La Valette, referring to the Grand Master, is a late corrupt use and never, never, used in the Grand Master’s lifetime. Nor when he died. The bronze inscription in Latin willed by his close friends over his sarcophagus, now in St John’s crypt, commemorates FR.IOAN. DE.VALLETTA. His dear friends did not mock him by fictionalising his name. I am glad to note that all leading modern historians, who in their earlier writings referred to the Grand Maser as La Valette, have, in their recent publications, taken over the correct name: de Valette. These include Albert Ganado, Joseph Sammut and Stephen Spiteri. In its postage stamps, the Order of Malta captioned a portrait of the Grand Master: F. IOANNES DE VALLETTE. I hope to have shown that the Grand Master’s name was never La Valette. It is only disregard of history and distortion of historical truth that have usurped his chosen identity and have foisted on him a false self he never wanted, by taking advantage of the fact that he was then dead and his sacred memory vulnerable. I have also noted a significant shift in those who persist in embracing misinformation. First it was that they were right, and I was wrong, ignorantly wrong. When it was proved that they were wrong, supremely wrong, their second line of defence became: what difference does it make? What’s in a name? I see. When I am wrong, that name is important. When you are proved wrong, that name becomes unimportant. Or they fell back on a faux democratic defence: the majority is wrong, so the majority wins. Names and surnames determined by majority referendum. To take part in it you need a doctor’s certificate that you are allergic to historical truth. The bottom line seems to be: should we persist in pandering to ignorance? Should we camouflage our pig-headedness, once historical inaccuracy has been exposed, under the veil of collective memory? For me, what is labelled collective memory may have some value at times, but not when it flies in the face of historically ascertained fact. No value at all. If I have to choose between a fictional collective memory and an established historical fact, I would have very little hesitation. Sometimes I am tempted to consider collective memory a poor excuse for failure to do your homework properly. Virtually every popular book on Malta, and every tourist guide, repeats the fable that the English knight, Sir Oliver Starkey, Latin secretary to de Valette, lies buried by the Grand Master’s side in the crypt of St John’s. This is historical nonsense. His ‘tombstone’ is no tombstone at all. It is a small marble tablet a British Governor put there in the 1830s to record the (true) fact that Starkey composed the epitaph on de Valette’s tomb. Starkey is not buried there, and in no way does the marble in­scrip­tion claim he is. But that silly and totally untruthful legend that the British knight is buried in the crypt where only Grand Masters were laid to rest, has now grown to form part of the collective memory, repeated to the point of nausea. So, should we violate the truth and repeat a lie because that lie now forms part of some ridiculously uninformed collective memory? It is also undoubtedly part of some weird collective memory that Count Roger the Norman gave the Maltese their national colours. This sacred collective me­mory is nonsense, a pure invention which a patriotic do-gooder fab­ri­cated in 1841. But it is now firmly entrenched in our collective memory. Which is to prevail, historical fiction or historical truth? Of course, fiction, figments, fabrications have always had a shriller audience than documented truth. Maybe we should immortalise this fiction on the pedestal of the Grand Master’s monument. Insult his identity and call it honouring his memory.